7.71 points at 14 votes (rank 150). 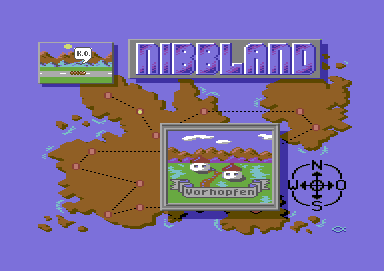 Super Nibbly is a development of Nibbly '92 from 1992. Here you play the saucy worm "Jean Flups" on the map of Nibbland from town to town (whereby each town consists of 4 maps). 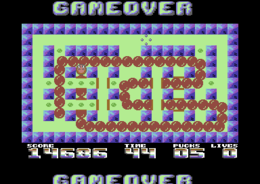 As a speciality, many extras are hidden in the levels (bonus time, extra points, etc.). Furthermore, you can shoot your own head with the help of Pucks and by this keep the body short. In the higher levels, there are one-way streets and you can proceed over or under bridges. There is also a level with invisible pills. Puck Can be shot with fire. Munching without growing. Clock 40 seconds extra time. Fruit Gets 100, 200, 400, 800 points and finally an extra life. Skull Loss of a life. Elixir 1 Worm is shortened a bit. Elixir 2 The body of the worm is completely removed. Big sun Pills get bigger and the growth gets more by this. Small sun Pills get smaller and the growth gets less by this. The sun gets big and small in turns, therefore the time of picking it up is decisive for the effect! there is an extra life every 10.000 points. To leave the title screen press the fire button. 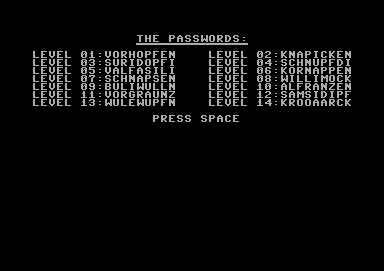 Then a password can be entered to begin at a higher level. Confirm with the "Return" key. If no password was entered, the game will start in the first town. 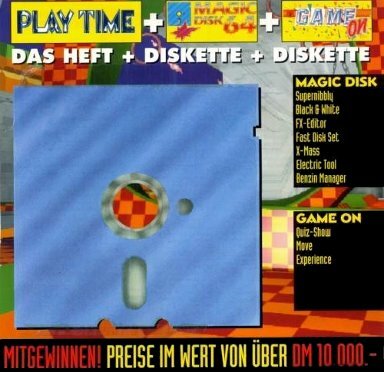 In the game you can switch to pause any time by pressing the key "F1". By pressing the key "Restore" the current level is started anew. This costs one life. Jean Flups follows the joystick movements. By pressing the fire button a "Puck" is shot. You will visit the following villages in the course of the game: Vorhopfen, Knapicken, Suridopfi, Schnupfdi, Valfasili, Kornappen, Schnapsen, Willimock, Buliwulln, Alfranzen, Vorgraunz, Samsidipf, Wulewupfn, Krooaarck. These villages are at the same time the passwords. The version by Excess crashes after Alfranzen. 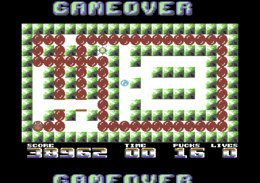 The version from C64Games do also load Vorgraunz and seem bug-free. FXXS: "If you liked Nibbly '92, you will get a successful follower. If you did not know Nibbly before should rather try the forerunner first, the time limit and level desgin are not really beginner-friendly but varies in the higher levels between mere speedruns and puzzle rounds. All-in-all a 8,6, so a close 9." TheRyk: "The bonus items and the 'pucks' you need to complete some of the levels are nice extras. Graphics are pretty much the same as in the predecessor, but there's more and better music and a bunch of new surprising and challenging levels. Great stuff, Sommer family, 9 points!" 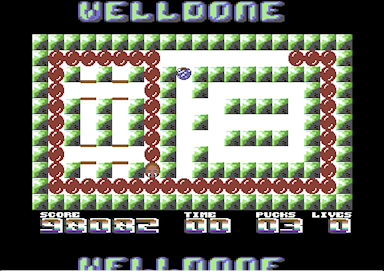 In the version "Super-Nibbly-(+hi)-(v1)" available on C64games.de, the highscore list can be saved on disk and also reset to basic values (reset, then load "SAVEHI" and start, see info file in the zip). This page was last modified on 8 May 2017, at 00:25.